The party’s strategy director Dr Dzulkefly Ahmad says Najib needs to ensure the nation is not inadvertently compromised in his ‘desperate rush’ to seek China’s economic assistance. KUALA LUMPUR: Parti Amanah Negara strategy director Dr Dzulkefly Ahmad today asked where Malaysia is going with its relationship with China. Saying this question bothered many discerning Malaysians on both sides of the political divide, he warned that Malaysia must not be inadvertently politically compromised, as a result of being lorded over economically by China. 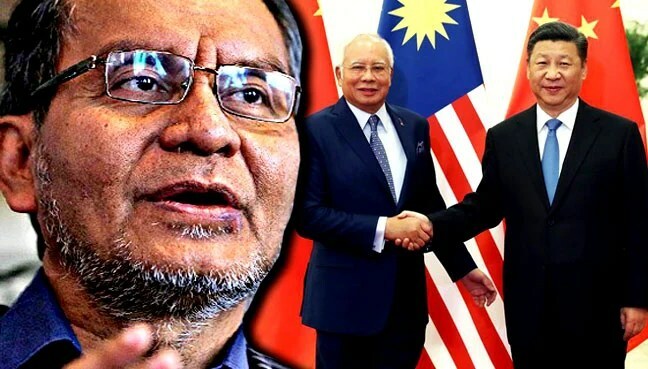 Dzulkefly said in a statement that there were many questions regarding Putrajaya’s current wooing of China that Prime Minister Najib Razak had to answer. This includes giving the contract to be a master builder for the Bandar Malaysia project to a China-Malaysia consortium and then withdrawing it, to seek other China partners. He was referring to a dispute between 1MDB and Abu Dhabi’s International Petroleum Investment Company, or IPIC, over payments which IPIC said it did not receive but 1MDB said it had paid. It was later settled, but 1MDB now has to pay the money owed. Malaysian taxpayers via the ministry of finance (MoF) now have to bear the burden of about RM26.4 billion in payments to IPIC. Dzulkefly said: “The need for a wider debate or consultation from pertinent stakeholders, on pursuing such aggressive and excessive investment from China, has never been entertained, much less desired. Describing Najib’s wooing of China as a “frantic move”, he said it appeared that the prime minister was in a “desparate rush” to “solve his immediate predicament but seems oblivious of the grave downsides of doing so, on a longer time-line”. He suggested that an open tender be called for the development of Bandar Malaysia. Where is Malaysia-China relationship headed? 1. Even before the dust could settle out of the whole fiasco of Bandar Malaysia’s unfortunate abrupt termination of the share sales agreement (SSA) with the consortium IWH-CREC, Malaysians continue to be confronted with unending questions that beg immediate clarity and purpose. 2. Coming close on the heel of the controversies surrounding the 1-MDB-IPIC’s arbitration ‘settlement’, the PM’s unilateral decision in relying one superpower to help build Malaysia is at best disconcerting, if not outrightly imprudent. 3. The need for a wider debate or consultation from pertinent stakeholders, on pursuing such aggressive and excessive investment from China, has never been entertained, much less desired. 4. What are Malaysians to make out of all these ‘wheelings and dealings’, especially with an economic superpowerhouse like China, that they least understand? 5. Where are we really heading with this relationship with China is surely a question that bothers many discerning Malaysians, and arguably on both sides of the political divides. 6. Unlike the bold step of his late father in pursuing unprecedented strategic diplomatic ties with a more-than-taboo Communist China then, Najib Razak’s frantic moves, pale in comparison, 4 decades later. 7. Meanwhile Najib courted Dalian Wanda Group, China’s largest property and entertainment group. Incidentally, Wikipedia has it that Wanda Group is the world’s biggest private property developer (The Economist, Feb 14, 2015). 8. The local media didn’t fail to report that as if Wanda’s Chairman and China’s richest man, Wang Jianlin was very keen on the ‘investment in Bandar Malaysia worth ‘US$10bilion (RM43billion)’. To the chagrin of Najib, Wanda was ostensibly non-committal. 8. Be that as it may, in his hurried (read desperate) ways of getting China to ‘heavily invest’ in Malaysia, Najib ostensibly depicts one Prime Minister, who is in a real rush to solve his immediate predicament but seems oblivious of the grave downsides of doing so, on a longer time-line. 9. Will we now see a revival of the cancelled deal of the SSA, with the consortium IWH-CREC, after the Chinese Prime Minister Li Keqiang told Najib that he wanted the SSA deal with the China Communist Party’s owned CREC ‘to remain unchanged’. If he succumbs, he will surely lose face as the head of a sovereign state. An open bidding is also in order should a Master Developer is to be found again for Bandar Malaysia. 10. Amidst intense speculation bandied about that the deals were undertaken with the aim of settling the outstanding debts arising from the scandal-ridden 1MDB project, the choice between a private company or a state run enterprise is arguably pertinent much as it is also sinister. 11. Najib must be strongly reprimanded that while the nation is dire need of foreign investment, we deserve a better and a longer range view of the nation’s sovereignty, independence, dignity and destiny. Malaysia must not be inadvertently politically compromised, as a result of being lorded over, economically by the People Republic of China. Time to make sense of where we are truly heading Mr Prime Minister! Ex-EC chief tells latest EC chief not to be BN’s lackey…….Do we need to say more?